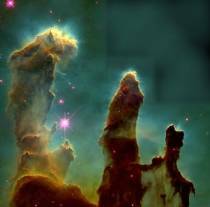 The Galactic Question Center: Religion and Paranormal? We search the world, asking questions. Sometimes we get answers that change the way we look at our lives and the cosmos. You are exploring Nazareth, the historic city of Lower Galilee in northern Israel. As you walk through a field you are accosted by seven rodents. One of the rodents whispers "Yeshua," the name of Jesus in the Hebrew language. Another appears to be wearing a crucifix. What is your reaction? Is this experience sufficiently paranormal to alter any of your religious beliefs? I would investigate further, assuming I wasn't about to miss a dinner date. The crucifix would suggest a human interference in the natural activities of the rodents. If it could be established that the rodents possessed the physical faculties to speak, then I would carry the supposition of human interference sparked by the crucifix to that as well, and take it as likely that a human had so trained the rodent. Ham and swiss on rye with a small dash of ergot? This site is becoming consumed with pseudo religious speculation. Does this add or detract from the problems extant in the world? (especially while debates regarding religion tend to act as a catalyst for the continued horror of bloodletting). Well, universal truth is universal. Hearing a mouse clearly say, "Yeshua" would indeed make me pause and say, "Pardon me, who is 'Yeshua'?" If his answer matched my definition, I would re-consider some of my thoughts. I would love to have a 'religious' no... an active listening conversation.. better... with a non-human. I would most likely think that my tour guide slapped a few tabs on my back while I wasn't paying attention. Who are Eureka and Cliff?